program photo from "She Stoops to Conquer"
One of the Guthrie's smaller experimental theater spaces from 1968-1971. In the late 1960s, Minneapolis’s Guthrie Theater company became interested in producing plays outside of its main theater, particularly smaller spaces that would allow a more intimate setting for the audience and actors. 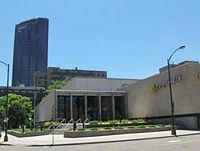 On Dec. 29, 1967, the Guthrie opened the Guthrie Crawford-Livingston Theater at the Minnesota Arts and Science Center at 30 10th Street East in St. Paul, creating a separate St. Paul repertory season in this 500-seat theater. At the Crawford-Livingston, the Guthrie staged productions such as “She Stoops to Conquer” and “Enrico IV” in a short season in 1968-1969, but ceased use of the space in 1971. However, the Crawford-Livingston and the Guthrie's other experimental theater space, The Other Place Theater, first sparked the Guthrie’s interest in varied performing spaces, eventually leading to its newest, multiple stage location in 2006. The Minnesota Arts and Science Center is now the location of the McNally-Smith College of Music, and the Crawford-Livingston Theatre space has been home to the History Theatre since 1978. Guilfoyle, Peg. The Guthrie Theater: Images, History, and Inside Stories. Minneapolis: Nodin Press, 2006. Levy, Simon. The Guthrie Theater. Minneapolis: The Theater, 1978. Print.